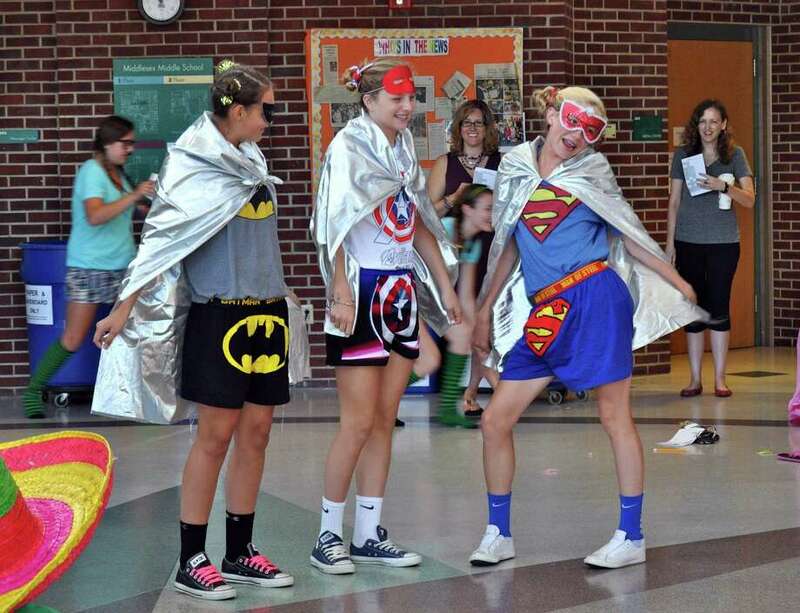 Team Free Falliní shows off their festive costumes: Erin Karczewski, Paige Whitney, Katie Cronin at Middlesex Middle School in Darien Conn.
Middlesex eighth grade students on the Green Team showcased their creativity, style and physics knowledge recently by holding a "Flugtag," which in German means "flight" or "flying" day. The full-day event was fashioned in the style of the Red Bull-sponsored Flugtag events that challenge teams around the country to build homemade human-powered flying machines that they attempt to fly off a 30-foot deck (see www.redbullflugtagusa.com). The Middlesex eighth-graders flying machines, however, were not human-powered but were launched off the Middlesex Middle School roof. The objective of the MMS Flugtag was to teach students about the physics involved in flight and to have them design a craft to launch off the school building. The flying crafts, which MMS students called the FliegenVogels ("flying birds") had to have a 5-pound weight limit and a 12-inch wheel base able to roll down an 8-foot ramp mounted on the school's roof. To help them design their flying creations, the students have been learning in science class about gravity, friction, Newton's laws of motion, air resistance, momentum, and collisions. All of these properties of physics affected how well each craft flew (or didn't fly). Students organized into 35 teams to design and build their Fliegen Vogel. Each team also had to create a team logo and costume as well as some other model, exhibit, or performance relating to their flying craft. On launch day, the teams, dressed in costumes, weighed their Fliegen Vogel and prepared to watch their craft launch from the roof. Green Team teachers Kathryn Vespe and Tim Sorensen were in charge of launching the students' creations off the 8-foot ramp on the roof in back of the school while Lisa Petersen, Green Team leader, organized the event from the ground. While Sean Edgar, Michael Parsley and Billy Platt team's (a.k.a. the Darien Globe Trotters) aircraft flew the farthest (29 meters), the students judged each other's creations and awarded winners in several other categories.